I am excited to share that I have my own apartment again! Our move-in date is still a month away, but I am beyond excited to begin preparing to move again. We have gotten so many beautiful gifts from our wedding that I am excited to find a home for! It has been fun to start dreaming of how to make our new apartment a home (we are hoping not to move again for the next 4 years if possible! ), but it can also be expensive. We took our first trip to IKEA last week, and even the small and inexpensive pieces add up. Since we are working on a tight budget and have some free time, I have been tackling a few DIY projects and getting back in touch with my creative side. 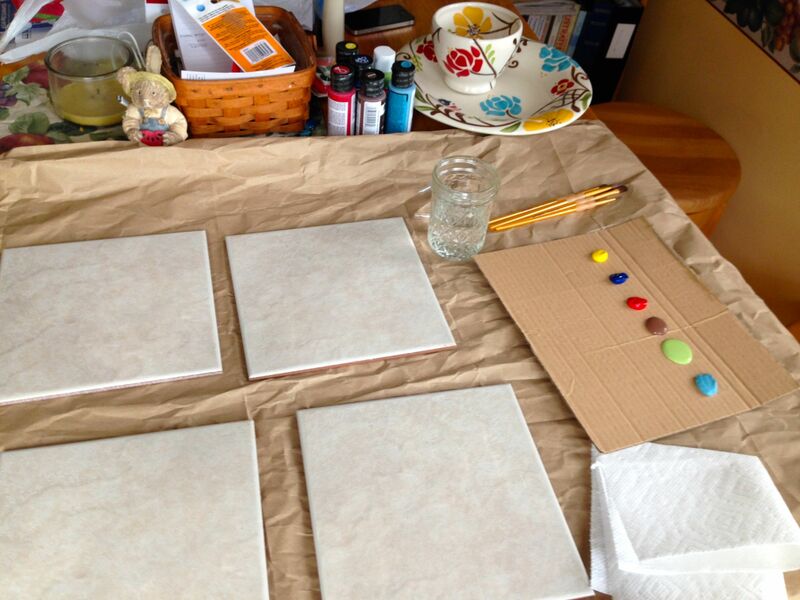 My first successful project has been turning old ceramic backsplash tiles into trivets (or, if you are like my husband, the things you set hot dishes on when you serve dinner). I have seen so many trivets that I love from online stores, but they all seem to come with a hefty price tag that I cannot afford. While these don’t quite fit into the “necessary and willing to pay for” line of our moving budget, they also are something that I would really like to have. I was inspired by one of my mom’s own trivets that is essentially a large decorative tile with feet, and knew that I could make something similar at a far smaller price tag! Before starting, I headed to Michael’s to pick up some acrylic paint and brushes. I like Folk Art Multi-surface paint for any kitchen projects. It is a bit more than the store brand, but the paint is thicker and has a smoother finish, and it also has the best (and longest lasting) results when baked in the oven. To start my project, I lightly washed the tiles with soap and water. After letting them dry for 10 minutes, I lightly wiped the surface with rubbing alcohol. While they dried, I set up my workspace with newspaper, a color “palette” made out of the side of a cardboard box, water and paper towels to clean my brushes, and my dishes for pattern inspiration. I practiced a few flowers before beginning, and decided that it was less work to freehand the flowers than it was to create stencils. 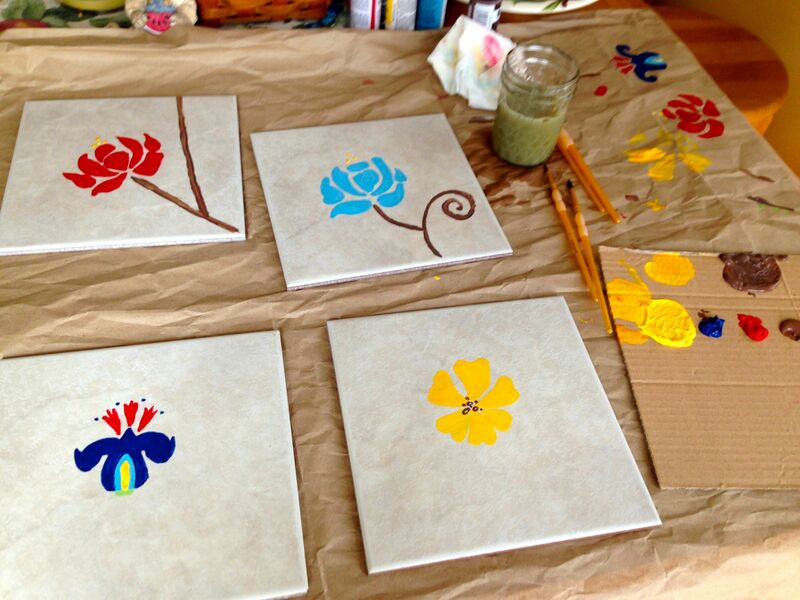 If you are less confident in your painting skills, I have used some great stencils for other projects before. They add a bit in up front cost, but if you will use them for multiple DIY projects than they can be worth the investment. You can also create your own stencils with card stock and an exacto knife, but this is time-consuming and works better for larger DIY projects. 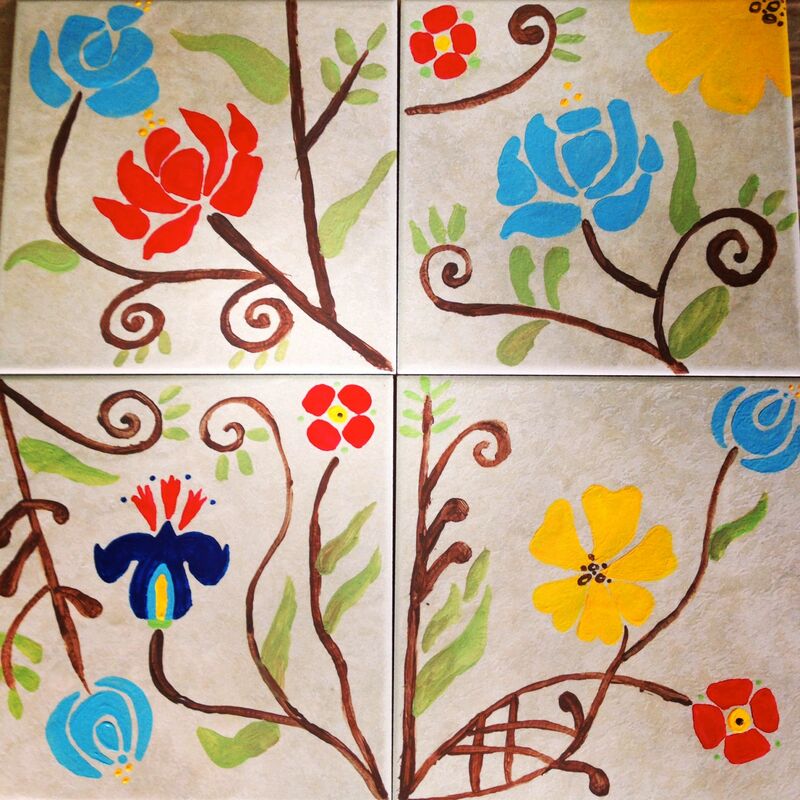 After feeling confident in my painted flowers, I began to paint my tiles. I am not so much of a plan-ahead type of painter, and prefer to add slowly and let my design flow organically. I started with one large flower on each tile, then added vines, leaves, and smaller accent flowers until I was satisfied with each tile. Once all of the tiles were complete, I transferred them to a cold oven. Then I turned the oven on to 350 F and allowed it to heat. (Do NOT put your project in a pre-heated oven!) This step allows the most even baking of the paint, and also prevents your project from cracking (a step that is more important when working with glass and fragile ceramics, but you can never be too careful!) 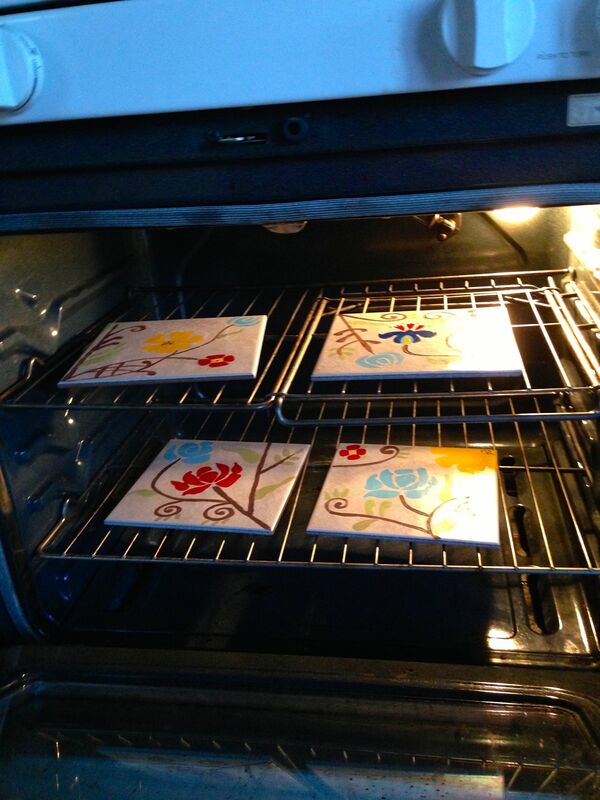 After your oven comes to temperature, set the timer for 30 minutes and allow the tiles to bake. Once baked, allow to cool completely in the oven. The following morning, I added self-adhesive foam dots to the bottom corners of the tiles to raise them slightly off the table. They are now awaiting a test run in my new kitchen! I love that they match my new dishes, and that they are pretty enough to be used to add some color and decoration to my new kitchen! This is a fun project that can be simplified as much or as little as you want to! I also think the painting part would be fun to do with kids! Even better, I made 4 trivets for less than one store bought trivet (about $18 for 6 acrylic paints, paint brushes, and foam dots). If you do not have old ceramic tiles, they are inexpensive at any home improvement store and will only add $1-2 per tile to your project! Question: Are you a DIY home decorator? What has been your most successful project? My next project? Refinishing new-to-me furniture! Entry filed under: Random. 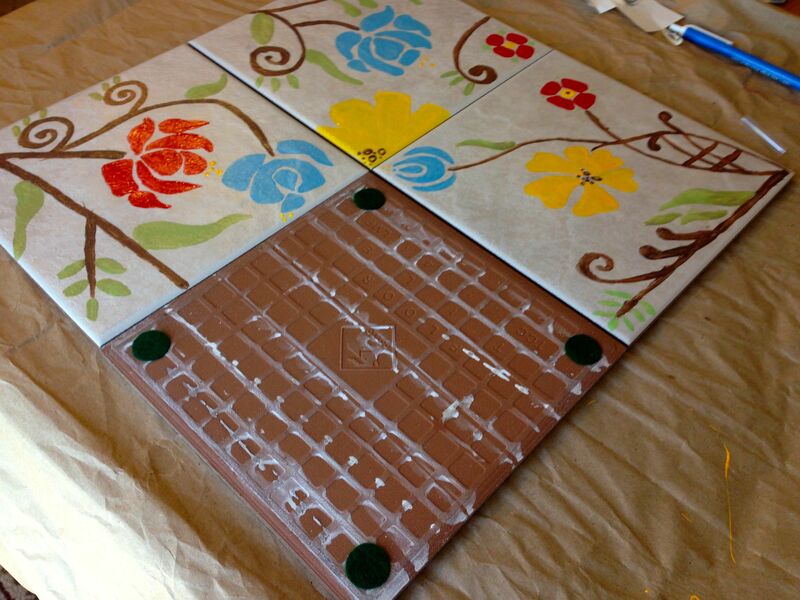 Tags: craft, creative, DIY, hand made, homemade, painting, tiles, trivets. These are so beautiful! They’d be such a jolly little inclusion for my kitchen!